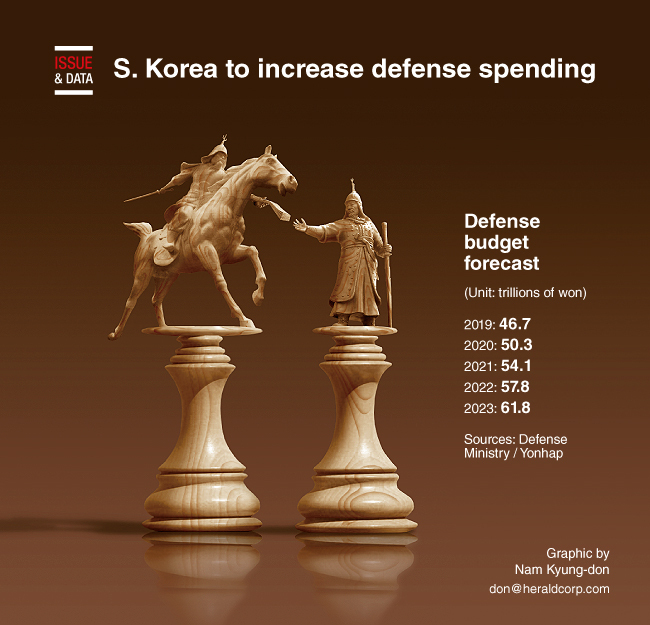 South Korea will increase defense spending by an average of 7.5 percent each year over the next five years, the Defense Ministry said. The ministry announced its defense blueprint for the 2019-2023 period, when it intends to spend 270.7 trillion won ($241 billion) -- 94.1 trillion won on improving defense capabilities and the rest on managing troops, equipment and facilities. Under the plan, the ministry seeks to increase the country’s defense budget, which stands at 46.7 trillion won this year, to 50.3 trillion won for 2020, 54.1 trillion won for 2021, 57.8 trillion won for 2022 and 61.8 trillion won for 2023.